Mix the flour, sugar, cocoa, xanthan gum, baking soda and salt together in a large bowl. With a hand mixer on low speed beat in the olive oil, vinegar, vanilla, zest and orange juice until smooth. 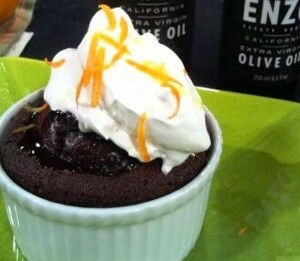 Pour the mixture into ramekins lightly greased with butter. Bake for 25 – 30 minutes or until a cake skewer inserted in the center of the cake comes out clean. Do not overbake the cake. They should be slightly firm to the touch. Pick olives when they are green and firm before they start to turn. Crack each olive with the back of a small frying pan, rock, hammer, block of wood or any other device that will crack the olive and not the pit. Immerse the cracked olives with water in a plastic (non-corrosive) container. Place a lid to keep the olives submerged or they will discolor. Change the water daily for at least 20 days depending on the olives and how bitter they are. Taste and continue to change the water if they are too bitter. 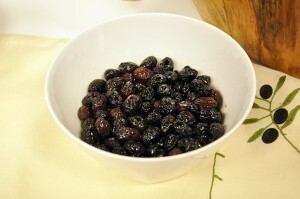 When ready, place the olives in a brine (heavy salt solution) about 3/4 cup of salt to 2 quarts of water. To store, place olives with brine in jars/ Place lemon slices and a grape leaf on top to keep the olives submerged. Can be stored in cool place or the refrigerator. To serve, wash olives or you can soak them overnight to remove excess salt according to your taste. Add garlic, lemon juice. cracked coriander seeds and olive oil to the olives and enjoy. Refrigerate after condiments have been added. “This recipe was shown to me by Papou (my grandfather, Vasilli). He was still picking and curing his own olives until he died at the age of 96,” says UC Master Gardener Marie Antoniou. Pick olives that are black and still firm. Do not use olives that have fallen to the ground. Place the black olives in an old pillow case or burlap bag. Use 1/4 pound of rock salt to one pound of olives. Place in the bag with the olives and shake it up. Hang the bag in a cool place like the garage or patio. Place a bucket under to catch the drips. After 1 week, check the mixture to see if any salt is needed. Shake well. Repeat this weekly and be sure to shake the mixture. Curing should be completed in 30-45 days. Taste occasionally. To serve, dip olives momentarily in boiling water. Can be soaked overnight to remove excess salt to taste. 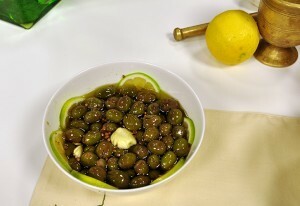 Coat olives with olive oil and serve. Word of Caution: if, at any time, the olives become soft or bad smelling, do not eat or taste them. Mold or scum may form on the brine. Skim it off as soon as it appears. If the mold growth is heavy, destroy the olives. If you have any questions, please e-mail Marie at marie_antoniou@yahoo.com.